One of the most fascinating species to observe in Northern Canada is the Polar Bear. During the winter months in the Arctic regions, it is dark all day long, and the polar bear populations gather for the long winter months. There are approximately 25,000 polar bears in the wild, with about 60% of them found in Canada alone. Polar bears are marvels of evolution. To be able to live in the cold arctic environment, they developed 4½ -inch thick layers of fat and huge padded feet. Their broad paddle-like forepaws act like snowshoes for walking on ice and snow, and work like oars when they swim. Polar bears rely heavily on their sense of smell for finding food and other bears. With their keen sense of smell, polar bears can detect prey from as far away as 20 miles, even through snow or ice that is six feet thick. In summer, sea ice melts first along the heat-absorbing Alaskan coastline. Polar bears find cracks in the ice pack that are narrowly open or thinly frozen over, for hunting seals. Most bears in the Beaufort and Chukchi Seas stay on the main pack to hunt, as it recedes miles from shore. Bears distribute themselves along the ice edges, where they have better access to seals. Outside of the main ice pack, isolated ice floes break into smaller floes or large patches of unconsolidated ice. Bears that are isolated from the main pack or land use these floes like a series of floating islands for hunting or resting. Eventually the floes become too small for a bear, which may have to swim to the main ice pack or to land. As summer turns into fall, theArctic begins to cool. During the onset of the long dark winter, virtually all of the Arctic Ocean refreezes. In fall, ice and bears return nearer to shore. As autumn progresses, temperatures cool, and ice begins to form again. Polar bears follow that leading edge of ice south, eventually occupying the shallow waters of the continental shelf, where the seal population is highest. To adapt, polar bears build fat stores necessary for winter survival. Pregnant females particularly fatten in early autumn to fuel their long winter fast and the nursing of their cubs. Later in autumn, they look for winter birthing dens near the coast or on stable ice pack, near good hunting habitat. Long swims between sea ice and shore deplete their body stores, affecting their reproductive success. If you're fascinated by polar bear ecology, there's no better time to visit the polar bear capital of the world in Churchill, Manitoba, Canada. With a variety of different vacation packages, Canada Polar Bears tours offer packages for just about any polar-bear enthusiast. 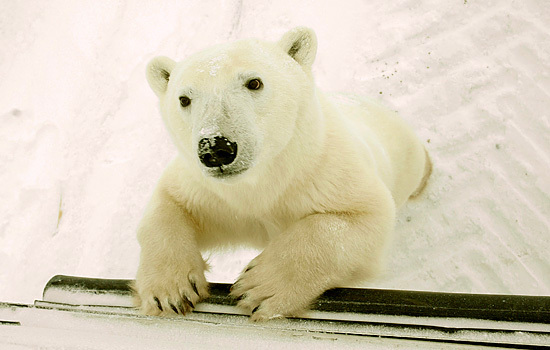 Spend a few days with an expert guide and take a close-up tour of the polar bears via our safety-proof tundra buggies. Once you've got the ultimate polar bear experience, check out the quaint town of Churchill and explore the famous Eskimo Museum and Parks Interpretation Center. Need more information on Canadian Polar Bear Ecology and Behavior? Talk to one of our Canadian travel Insiders who'd be happy to answer all your questions.